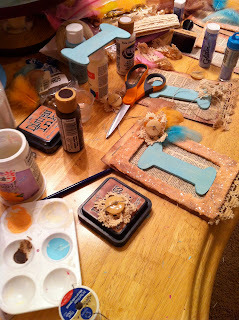 Things have been totally *crazy* around here with multiple house guests, traveling to Florida, working and teaching a Medical Terminology class, but somehow, I'm squeezing in some crafting time too. I am participating in a charm swap and below is my charm. Simple, but sweet - I think! My charm was inspired by a class I took with Shea and Debbie at Creative Connection a few years back. This version is much simpler than the over the top, blinged out version we made there. I like it though, - just the way it is. 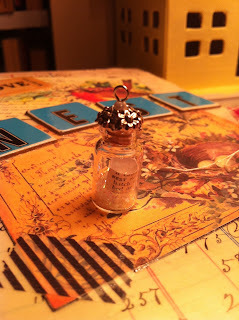 It's a small glass jar filled with glitter and pearls and a little definition of the word "Nest" tucked inside. I topped it with a sweet floral bead cap and another little pearl bead. There will be 12 other charms and our hostess Gail, will be attaching them to a necklace for us. As I mentioned in a previous post, my friend Laurie, who I met at last year's Birdsong, is hosting a banner swap. My letter, as seen below is "I". It's still a work in progress but I'm feeling good with the way it is coming along. Our banners will read, "sing". I'm still working on my matchbox and don't have anything to share just yet. Busy, busy! You'll have so much fun at both events - and fun with the swaps too! Enjoy every moment! no hating here.. but lots of jealousy!! but really.. Im happy for you. have a great time! I know you will! Love your charm bottle.. soooo cute! Fabulous, Lisa! I am SO EXCITED! !